In a way, the bacteria in your Aquaponics system serve as the carburetor as it functions to create a nearly ideal plant fertilizer out of your unusable fish waste. In this blog post, I will be explaining the procedure of creating a colony of beneficial bacteria within your Aquaponics system. The process is referred to as system cycling. 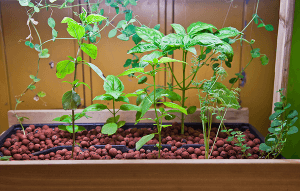 After reading this comprehensive and insightful article you will be able to fully grasp what you should do to jumpstart your system’s Aquaponic cycling and ensure that it turns out successful. You will also obtain a full understanding of the things you can do to make the whole cycling procedure a lot less taxing for your plants and your fish and also to expedite the process. You can also read our article to get some tips on how to start your system or cycling. Let us first define what Aquaponics Cycling mean. The process of cycling begins when you initially add ammonia into your system. Ammonia, which has a chemical formulation of NH3, is actually a kind of compound that is made up of hydrogen and nitrogen. The ammonia can either come from other sources or it could come from your fish. Ammonia, in itself, is very toxic to your fish and eventually it will kill them not unless it becomes reduced to a level that is considered non-toxic or if it becomes converted into less noxious form of nitrogen. Furthermore, plants do not readily receive the nitrogen that is in ammonia form, which means that even if the level of ammonia within your fish tank skyrockets, your plants still won’t get much of its nutrition. But you have got to hear this amazing news ammonia is perceived to draw nitrosomonas. Nitrosomonas are the first of the 2 nitrifying bacteria found in the air and if ammonia attracts them then these nitrifying bacteria will likely colonize the surfaces of your Aquaponics system. The great thing about these nitrosomonas bacteria is that they convert ammonia into nitrites or NO2. This is a very important step in the Aquaponics cycling process. But then again you’ll ask since nitrites are more toxic than ammonia how can this be a good thing? Well, having nitrites in your system attracts the bacteria that we want, the nitrospira. Basically, your nitrospira bacteria converts the toxic nitrites and turns them into nitrates and nitrates generally do not cause harm to your fish and they actually serve as great food for your plants. As soon as you discover nitrates in your water and the nitrite and ammonia concentrations within your system have plummeted to .5ppm or even lower then brace yourself because your Aquaponics system will be fully cycled and Aquaponics will have legitimately begun. Am I going to need testing tools? The answer is yes. You need to have some way of knowing where you currently are in the Aquaponics cycling process – which is about a four to six weeks work. 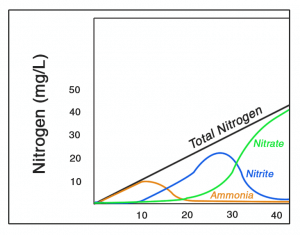 To be more specific, you need to monitor your nitrite, nitrate, ammonia and your pH levels so that you can be sure that all these components are within normal range. If it so happens that some or let’s say all of these components went beyond their normal range you need to take action right away to correct the imbalance. This is also the only surest way to know that your system is fully cycled and that you are ready to add your fish. Besides, looking at the daily progress of your cycling process is very fascinating and it is something you can only view through the lens of your test kit. Another important reminder, as soon as you reach the point wherein your Aquaponics system becomes fully cycled, you don’t necessarily have to monitor your system daily compared to the cycling process. So I suggest you tediously work through the cycling process and once that’s done all you need to do is to look forward to reap the fruits of your labor or, in this case, the fish of your labor. To do the test, a majority of Aquaponic gardeners make use of a product made by Aquarium Pharmaceuticals Inc., which they call API Freshwater Master Test Kit. This API Freshwater Master Test Kit is very easy to use and it is reasonably priced. It is also designed to monitor the cycling process of all fish systems. Aside from the API Freshwater Master Kit, you should also have a submergible thermometer to measure the temperature of your water. Just so you know, your water temperature can affect the health of your plants and fish and your cycling rate as soon as your system is up and running. You can read an article from our website to learn more about the supplies you need to optimize and manage your system. How do I start with the Cycling Process? As soon as you have set up your Aquaponics system as well as your test kit all there is left to do to start the cycling process is to simply add a source of ammonia. Customarily, you need to add fish into your system since their waste would already serve as ammonia. But since I’m not big on using fish as the primary source of ammonia I used a different technique which is called Fishless Cycling wherein you will be using an external ammonia source and incorporate it into your Aquaponics system. Read also the article from our website on why fishless cycling is recommended. First of all, you and your fish will more likely experience less stress since you won’t be trying to keep anybody alive during the whole process. Second of all, you can accurately control and regulate how much ammonia you want to add to your Aquaponics system during the process. Take, for instance, if you find out that your ammonia level is reaching 8ppm and there are no nitrites that have shown up, your action is to stop adding more ammonia to your system within the next few days to give more time for your bacteria to catch up. You cannot do this if you depend on your fish alone. The nice thing about this is that with Fishless Cycling it is very practical and you can fully stock up on fish in your tank as long as your cycling has been completed. This is better compared to gradually increasing your stocking levels as suggested when cycling with fish. This way of cycling is very beneficial for those who are keeping carnivorous or aggressive fish since they are less likely to eat each other if they are all introduced in the tank at the same time. How can I cycle without fish? There are a number of ways to incorporate ammonia into your system but, in my opinion, the best way to add ammonia is to buy our Cycling Kits. Our cycling kits come in three different sizes: Small which caters to less than one hundred gallons, the medium which caters to one hundred to three hundred gallons and large which caters to three hundred to five hundred gallons. All of these come with the exact ammonia you need to fully cycle your size tank. It also contains powdered seaweed to supply your plants with a rich source of micronutrients to get them off to a great start and it also comes with a complete set of instructions. If you employ Fishless Cycling you can safely add fish to your Aquaponics system as soon as your nitrite levels and your ammonia levels have shrunk down to a zero or any figure that is close to it and you have considerable levels of nitrates. These figures will tell you that both your nitrosomonas or your ammonia converting bacteria and your nitrospira or better known as your nitrate-converting bacteria are already fully established and are ready to process fish waste. Is there a way I can expedite the Aquaponics cycling? Sadly, nitrifying bacteria takes time because these are some of the slowest growing bacteria there are. This means that your cycling process can take about six weeks. However, there are some things you can do to expedite the process. You can read our article to get tips on ammonia, nitrites and nitrates after cycling. Temperature – Like all other microorganisms, your nitrifying bacteria proliferate much faster in warmer temperatures. The ideal temperature is between 77-86°F (25-30°C). If you reach 64°F (18°C) their growth rate can slow down by fifty percent. And if you reach 46-50°F (8-10 °C) their growth rate can further reduce up to seventy-five percent and can stop completely at 39°F (4°C). Your microorganisms will die at or above 120°F (49°C) and at or below 32°F (0°C). pH – Most bacteria want a pH range between 7-8. You can use hydroponic pH up and down products to maintain this range during the entire cycling process. Oxygen – You must know that nitrifying bacteria are aerobic and they will proliferate real fast under a highly oxygenated environment. So even if you are cycling without adding fish you need to have as much oxygen as you can in your tank as you normally would if there were fish inside. Just think about your bacteria as any other live organism (like your fish) that needs oxygen in your Aquaponics system. Adding bacteria – You can initiate the process by incorporating bacteria from an already established colony. Excellent sources of beneficial bacteria are also ranked here. The lower you go on the list the more chance you will likely have of introducing disease to your system. Microbe-Lift Nitrifying Bacteria, which is included in the Cycling Kits. Media from an already established Aquaponics system. Filter materials like bio wheel, floss and sponge from an existing disease-free aquarium. Gravel from another existing tank that is disease-free. Here’s a tip, a lot of local pet stores and aquarium stores are willing to give this away for free if you request for it. Other decorations such as rocks and driftwood from an established aquarium. Rocks from a wild pond, a lake or a river. Rocks from your backyard pond that has fish in it. When is the best time for me to add plants into my system? We highly recommend you add plants as soon as you have started with your cycling process. The reason behind this is that this gives your plants sufficient time to establish their roots and themselves before you introduce your fish and the nitrates that are to be absorbed. We strongly suggest you add MaxiCrop liquid seaweed (around a quarter to every two hundred to three hundred gallons) in your fish tank when you start planting because the MaxiCrop liquid seaweed will give your plants a high dose of micronutrients and in a way encourage them to put down new and healthy roots. If you avail of our Cycling Kits the powdered Maxicrop is already included as part of the package. You can read this article to know the number of plants you can grow in your system.